I was terrified to get to the point of having to feed Oliver more than milk! but it turns out to be a really fun experience…Here’s what I learned! 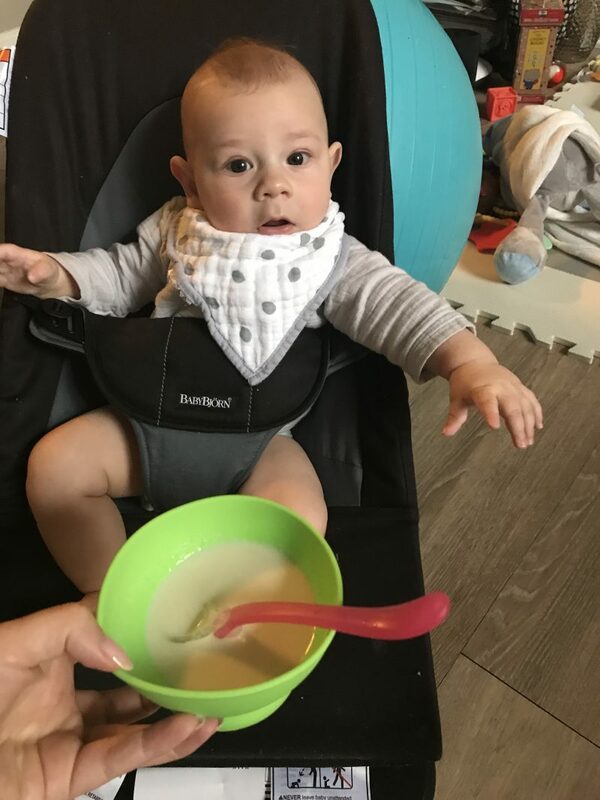 It is recommended to feed food other than milk to your baby at 6 months, it is also recommended to start feeding your baby solids when you can see that they’re ready! Oliver was starting to show some interest into what I was eating right before he was going to turn 5 months. he’d look at me with his little eyes and just wondered what the hell was I eating. Oliver was also on the smaller side so when he turned 5 months, I was recommended to start feeding him solids so he can grow more! I started with rice cereal which I had been against from the get go but I had been convinced by my NOT regular pediatrician that it was a must I start with it. Her reasoning was that babies will push out the food from their mouth until they get used to it, it’s too messy to do a vegetable first and they need to learn eating from a spoon first which all of these statements weren’t true for Oliver. He devoured his first bowl of rice cereal which indicated that he was definitely ready for solids, had no problem with the spoon and he wasn’t messy at all. But babies are different once again! What works for me & Oliver might not for you. 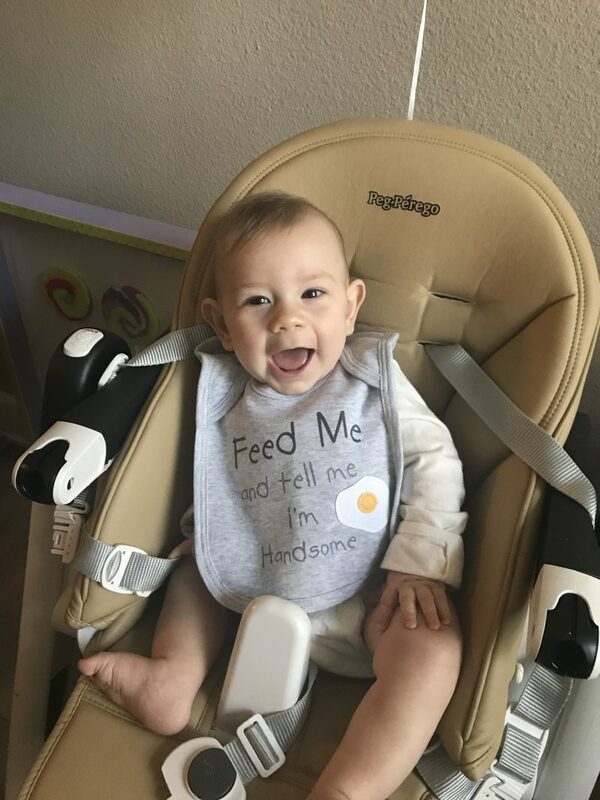 How do I know if my baby is ready for solids? What I’ve learned is that once your babe can hold his head by himself, shows interest in what you eat, doesn’t turn their head when you offer solid (don’t force your baby!) is when they’re ready. Why was I against rice cereal? Well, A) it’s dead calories. B) no nutritional value C) pretty much useless. I really wanted to start with a vegetable.I gave rice cereal to Oliver for three days and moved on to a vegetable. What is the main rule in giving solids? Now here’s how I basically did it and worked for Oliver: You try an appropriate vegetable for more than three days and move on to another; pass on to fruits. I started with Peas, I waited three days in between every time I tried a new vegetable. I quickly fed him twice a day because I could tell he was hungry for real food. Once you’ve tried a couple different aliment, you can make fun purees! Why do you have to try one vegetable at a time and for three days or more? To see if there’s any allergic reaction as it can take up to three four days to show any signs. The first purees are clean and just one veggie or fruit at a time. I used organic food and made him the purees. It was really fun. Once I moved on to a new veggie and fruit and waited the 3 day rule for each, that’s when I had fun mixing to or three aliment and eventually added oatmeal or other grains mixed in. I also waited the 3 day rule with these. He had a hard time with oatmeal as he didn’t like the texture or taste so I’d have to combine it with either a fruit or a tasty vegetable. You can eventually start adding spices at 8 months. I added cinnamon a little before though. I was recommended to start giving a little peanut butter at 6 months, first rub a little bit on the skin and see if there were any reaction and then introduce it very little. They believe that giving it earlier actually helps the body at not being allergic. There are fruits and vegetables that are only appropriate for certain age. So you have a category for 4-6 months, 5-7 months etc…plus foods that are a no-no until they’re a year old like honey. Below, is a website link with all these infos and charts for your babies first time food! TIP: add breastmilk or formula in your purees for extra nutrition and they’ll probably like the taste better. Also, some people say that starting with a vegetable is better so they don’t get too much of a love for a sweet taste. My little veggie & fruit cheat sheet to keep track. You can find them here. Click here for the 4-6 months sheet Full website link below in the article to find more! a must visit! 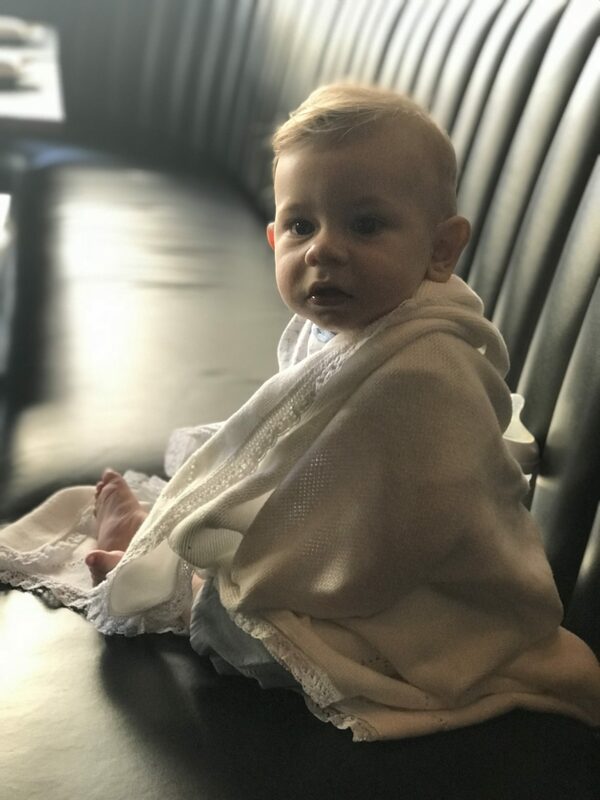 You don’t have to start with purees, a lot of parents start with finger foods but I wasn’t ready at the beginning to do that…I think it just depends on your baby and what you’re comfortable with. 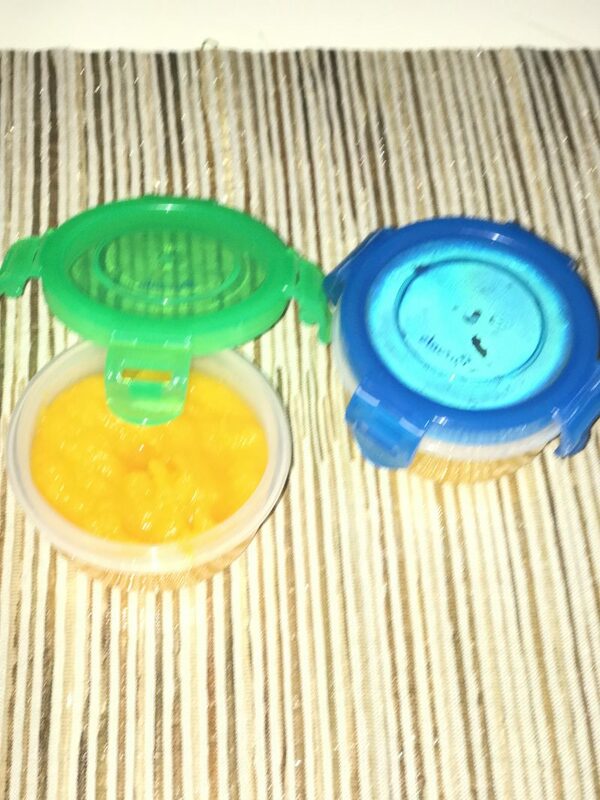 I bought Organic vegetables and fruits and made purees with the Beaba baby food maker. I love it and it’s so easy! It steams and blends into a puree. I still use it now for me and Oliver when I want to steam veggies or even fish! so don’t worry you don’t use it just for a couple of months only. I would make a little more than planned and put the extra puree in ice cube container or the beaba container and put it in the freezer. Once frozen, I’d put them in a ziplock and label them. You can try these after you have done a 3 day rule with each on their own. Also keep in mind that some are best at different ages. For instance mangos, I waited till Oliver was 7 months. do not salt or put sugar in your purees until they are ready for seasoning. I limit salt & sugar even to this day. Iron is super important for their growth especially if they are breastfed. Calories and fat are equally important. Mixing oatmeal fortified in Iron and then moving to high Iron foods is great like Egg yolks, the dark meat of chicken, quinoa, turkey….. TIP: I add a drop of blackstrap molasses in some recipes for extra nutrition and Iron! Babies need fat and calories! My pediatrician (my regular amazing one this time! haha) told me at his 8 months check up that he was too healthy. I was giving him food that was way too clean and that I needed to up his calories and fat intake. I could also start spices and be a little more adventurous. Also, this was recommended to me because Oliver was on the smaller side. For some moms with high percentile babies, they wouldn’t even have to worry about this which is great. I had to pay attention to everything he was eating and figure out how to up calories at each meal. Ok, so this doesn’t mean to go crazy, this just means that fries once in a while will not hurt him, coconut oil, olive oil, yogurt, maple syrup, sour cream were great options for us! and this was when at 8 months we switched to baby led weaning! Baby led weaning is when you teach your baby to feed themselves with their little fingers!!!! At first I was absolutely terrified but it was explained to me that purees are actually half the calories so for Oliver’s optimal growth I needed to start giving him pieces of food. My first reaction to Oliver’s pediatrician was “but he has no teeth!” and she informed me that their little gums are very strong and they can chew soft food just fine! I still remember the first day that I had to have him eat pieces of food. I was so scared that he’d choke. Luckily, I hadn’t left the ped’s office with a somewhat demonstration of what to do in case of an emergency! It pretty much looked like you’d put your kid upside down. Anyway, I cut Oliver’s pieces of food soooo small, he would just stare at it and look at me like “what?” I was like “oh my, he’s never give up on the purees.” he tried a couple bite but I could tell that he was still hungry and not really into it so I gave him a puree. That night I made some research and turns out that when the pieces are too small, they don’t have that ability yet in their brain to go an grab that little piece. Let alone their little fingers are still so all over the place. The next day, I cut somewhat bigger pieces and a rectangular piece of toast with very little butter. BINGO! he grabbed and started to munch on it. If i could’ve had a pair of goggles to make sure that these pieces of food made it down safely…I’d totally be that mom. My baby always gags when I give him pieces. Is it normal?Here’s what I learned is that some babies get accustomed really fast to pieces and some need a little more time. Gagging is normal, and Oliver does it here and there. He’s learning how to eat so I don’t get panicked, observe him and tap his back softly. If it was more than gagging and looked like chocking than I’d proceed differently. I heard that some babies gag at every bite, I would give purees and some pieces to ease into it and be patient with it. My baby will not grab the pieces, I have to feed it to her directly. is that ok? 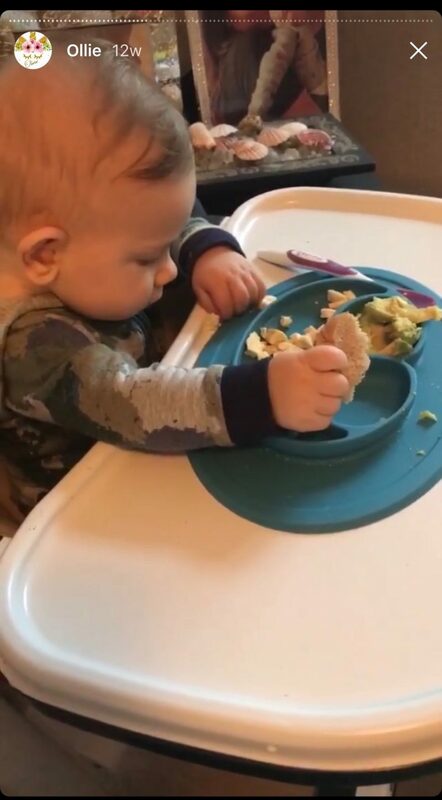 I was really told that baby lead weaning is for them to learn how to eat on their own, so at the beginning I was really hoping he’d grab the food on his own like a lot of babies seem to do…but Oliver wasn’t very good at it or just didn’t want to which is actually totally ok! they learn as they go! I couldn’t expect him to just feed himself right away. He now pretty much feeds on his own no problem 2 months later and gets better and better at chewing with his little gums! Egg yolk and pieces of banana mixed together like an omelet. add basil or Italian seasoning or cinnamon. add a drop of blackstrap molasses. Egg yolk with fresh spinach and basil. real oatmeal with a pinch of coconut sugar and banana. Plain yogurt. Pork sausage with egg yolk omelet and avocado. with tangerines. Lentils, garbanzo beans slightly blended with olive oil, pinch of garlic powder and cumin. ground beef made like a little patty; mix ground beef with egg yolk, nutritional yeast, drop of blackstrap molasses, cumin and tumeric. Cook with Ghee butter. avocado toast on paleo bread with tumeric, hemp seeds, drops of lemon and nutritional yeast. crockpot chicken thighs seasoned with onions, Italian seasoning, garlic powder, 1 sage leaf, 1 oz of water with yams, olive oil. Cook for 3 hours on high. Steamed sweet potato with cinnamon and olive oil and salmon with Italian seasoning. Sweet potato gnocchi with steamed yellow squash and sauteeds mushrooms in ghee butter with pinch of pink Himalayan salt. Quinoa with olive oil, nutritional yeast, Italian seasoning, ginger powder and steamed broccoli, peas, sweet potato sprinkled of goat cheese. and here’s what you’ll need for an amazing website! I’m not kidding, click here. This website in an absolute gem. My step mom referred it to me. It’s so detailed and will teach you EVERYTHING you need to know! 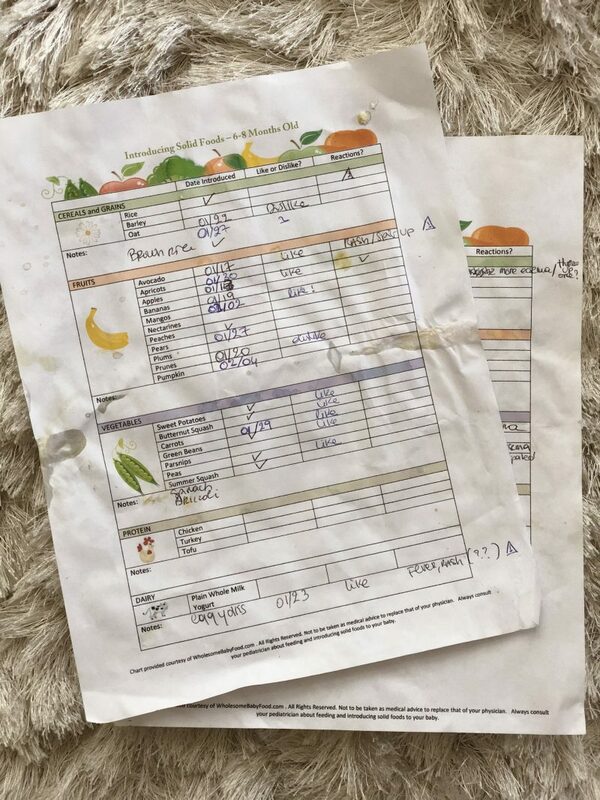 It has cheat sheets for what your baby can eat at what month, you can write down the date you started the vegetable, how your baby liked it and so on. I hope that all these tips & advice will help! if you enjoy this read please subscribe to my blog! thank you so much! Next Post #momlife: Sharing my honest feelings.